It's been a good week so far for two reasons. First - my Blog has had over 10,000 views! It has been a much bigger success than I could have hoped for when I started out on my online odyssey. So a big thank you to all of you for reading, commenting and sharing my trials & discoveries! I hope you will come back for more and help me to reach 20,000 views! Secondly, I have had my first article published by The Conversation, a thriving online newspaper where articles are submitted by academics and world experts. So how did I manage to smuggle something in?! As in so many things, it all comes down to contacts... A colleague of mine at work, Angie White, recently went down to London to do an internship in the Head Office of The Conversation and mentioned my interest in scientific writing. 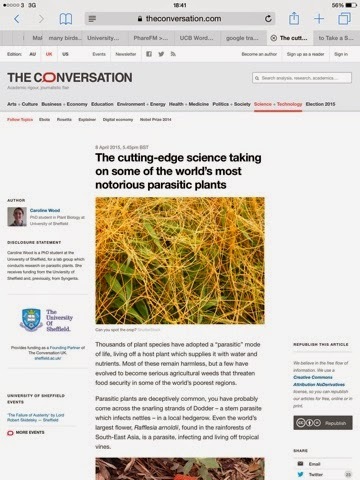 The editor there suggested that I could do an 'Explainer' article on the parasitic Striga weed. Several emails and a phone call later and here it is! It feels brilliant to have found another outlet for my passion and I am already trying to think what else I could write about for them. Stay tuned!